Looking for a last minute St. Paddy's Day treat? 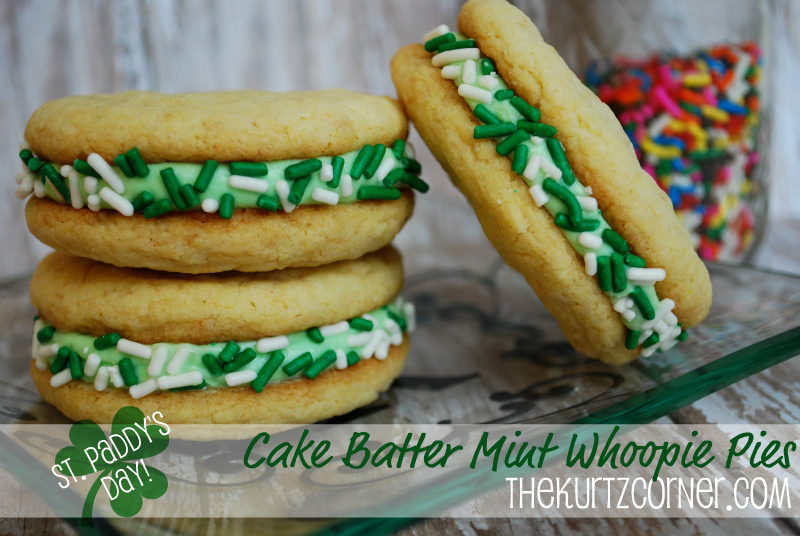 I have just the thing, Cake Batter Mint Whoopie Pies! If you haven't had an opportunity to try my Cake Batter Cookies recipe, here is your chance. This recipe is quick, easy, and if you bake a lot, like me, you probably have all of the ingredients just waiting in the pantry and fridge! Beat together your softened butter and sugar using an electric mixer until well combined. Add cake mix, flour, salt, and vanilla, mix thoroughly. Add up to 5 tablespoons of milk or more if needed to make a dough consistency. Roll dough into one inch small balls and place onto a baking sheet. Slightly flatten your dough balls. I like to use a rubber baking mat so that the bottoms don't burn. Preheat your oven to 375 degrees and bake your cookies for 9 to 10 minutes. Place on a cooling rack and set aside. Beat together your softened cream cheese, butter, sugar, and peppermint until well combined. Add in a few drops of green food dye and stir in. Add more food coloring until the desired color is made. Once your cookies have cooled, pipe the filling onto one cookie half and sandwich with the other. You can add green and white sprinkles to make them more festive, but it's not required. Refrigerate your pies before serving so the filling will set. After refrigerating for about an hour, I like to store them in a Tupperware at room temp so that the cookies don't harden. 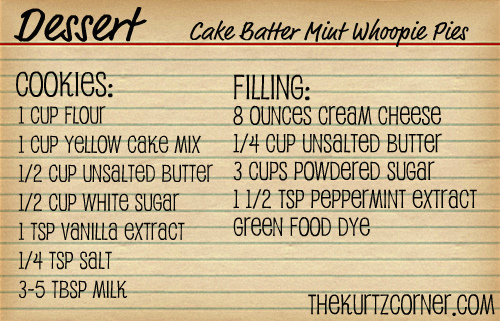 This recipe yields about 8 medium sized whoopie pies, it just depends on how big you make your cookie halves. Perfect with a tall glass of milk and don't forget a napkin, that filling likes to escape! Enjoy! These are going to be such fun to make! Those look delish! Sorry you had to re-write everything ;) It was worth it. The pics are amazing!! 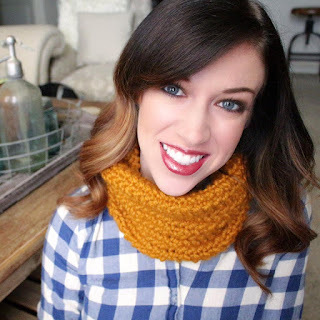 Hi Audra, Coming over from your blog hop. These look delicious, my family would love this. Thanks for sharing. I'm your newest follower. Yummy! I would love for you to link up at my linky party via: www.ourdelightfulhome.blogspot.com. Stopping by from Live. Laugh. Rowe. These are so cute! and look super yummy! Can't wait to make them, this is offically pinned to my baking board! These are fantastic! Especially love the sprinkles. Any idea how much this batch makes? Also, just to clarify, are you saying that we should put them in the fridge to help the frosting set up but then take them back out and store them on the counter? Thanks! Hi there! This recipe made about 8 medium whoopie pies, it just depends on how big you make the cookie halves. I did store them in the fridge for a like an hour before eating so that the filing would set. Afterwards I stored them in a Tupperware to keep the cookies from going hard. I hope that answers your question! Im going to have to try and make some whoopie pies soon. Thanks so much for linking up to Toot Your Horn Tuesday. Wow, I feel dumb now. I looked and looked through your instructions before asking and couldn't find out how many it made and now I see it. Silly me. Sorry. Just FYI, I used my small cookie scoop which makes about 1 1/2" cookies and flattened them a little bit and it made 28 cookies which were 2 1/2" in size after being baked. Thanks so much, they're yummy! These look so delicious! Shared them tonight on our FB page! 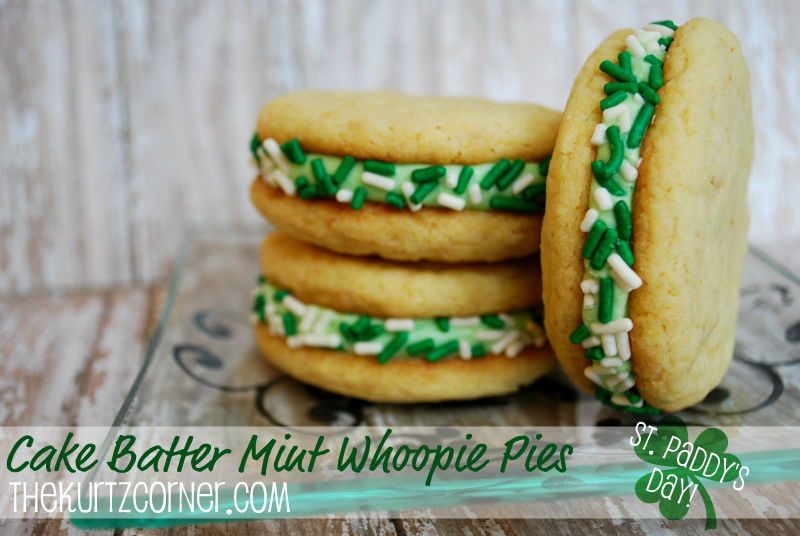 Thses are some seriously cute Whoopie Pies! I'm a new follower and would love to have you stop by my brand new blog and follow, too! Wow these look amazing and so yummy! Really cute, too! Looks delish! Following you from finding fabulous -stop on by for a visit!